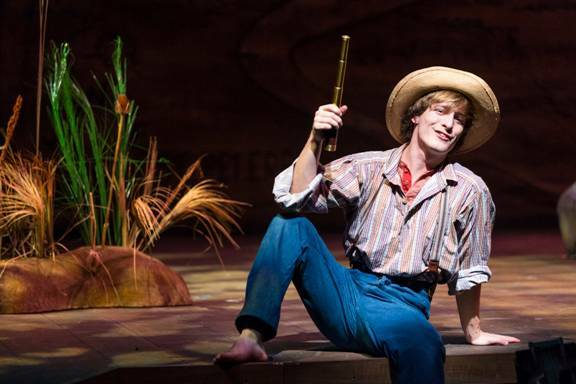 PALO ALTO, CA – We recognize him the moment he climbs on the stage from the auditorium wearing blue jeans, a striped shirt, a straw hat on his head and playing the harmonica; he is Huckleberry Finn. And we could add that ALEX GOLEY represents his character so convincingly, that we could almost believe that Huck had jumped out from the pages of MARK TWAIN’s novel on that night and sneaked into the LUCIE STERN THEATRE to tell the audience his story, in his own words. Which he does. 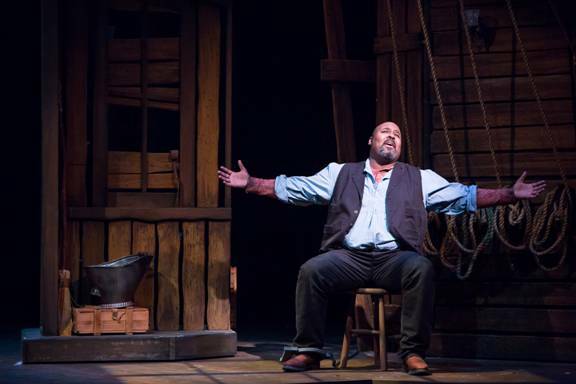 Masterfully directed by ROBERT KELLEY, the Theatre Work’s production of BIG RIVER, which opened to the Press on December 1st, manages to convey on the stage the essence of the adventures of Huckleberry Finn with such realism and affluence of feeling, that during the performance, the audience cringes with astonishment, laughs and cry. It was first published in l885, yet the story of Huckleberry, based in Mark Twains memories from his youth, still pulls at our heart's strings when running through its cobwebs we still detect the venom of the spider of racism. It is so strong that one hundred twenty five years later, racism continues poisoning people. Yet, this story is a simple story. 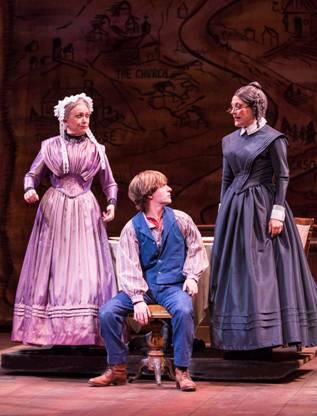 The story of a young boy named Huck, (GOLEY) raised by Widow Douglas (LUCINDA HITCHCOCK CONE, on the Left of the picture below) and Miss Watson (ALISON EWING, on the Right) in a Christian house where the bible is often quoted, yet Christianity is not practiced. The women try to teach Huck the Commandments, but never gave him the love that Jesus taught his followers to share with each other. So, not surprisingly, after Huck is returned by the authorities to his drunken father, he feigns his dead, by killing a hog and spilling his blood inside the house, and runs away. 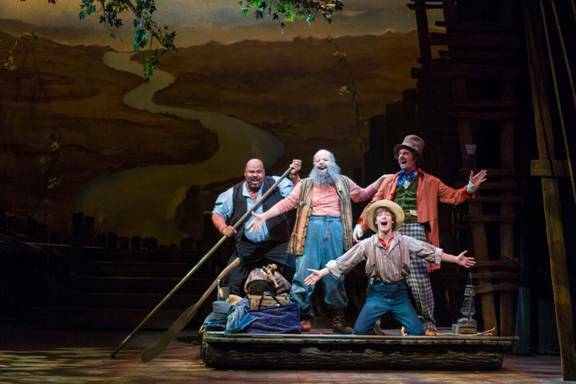 Huckleberry is really looking “for adventure” on his own, but he finds Jim (JAMES MONROE IGLEHART) a Black run away slave and as they float together on a log raft on the Mississippi river, they become friends. And in conversations with Jim, who is heading North to try to buy his wife who had been sold, and two white swindlers who call themselves “The King” (MARTIN ROJAS DIETRICH) and “The Duke,” (JACKSON DAVIS) Huck learns what he could have never been able to learn in his school’s classroom. He also finds himself. Because all the actors in the musical give true-to life performances, we the audience also learns about slavery and about the live in past in the Southern part of the United States the shame of which we are trying to forget, as we watch a boat also floating on the Mississippi River carrying to prison the slaves who had tried to scape. We also cringe with pain, even cry for what happened to Jim, when he is discovered, put in chains and Sold, by “The King” and “The Duke” for forty dollars. The ROGER MILLER’s music of the musical is tuneful and its lyrics appropriate. In this production is played in guitar, sang in duets or by mixed choirs accompanied by the orchestra under the masterful direction of WILLIAM LEBERATORE. Some of the best songs that night were: “Do you want to go to heaven? A funny duet, in which Widow Douglas and Miss Watson assure Huckleberry that if he wants to go to heaven all he needs to do is to learn to read his bible. “Waiting for the light to shine” a sorrowful solo sang by Huck, “River in the Rain” and “Words apart” two meaningful duets sang by Huck and Jim, and “Free at Last” in which Jim who was a dark mellow powerful timbre of voice, made us cry with his felt interpretation. Beautiful were also the Spirituals sang in the mixed voices of the slaves’ choir. For those who read “The Adventures of Tom Sawyer” before, this WILLIAM HAUPTMAN’s adaptation of the novel “Adventures of Huckleberry Finn (Tom Sawyers Comrade) written by MARK TWAIN, the musical BIG RIVER will give them a chance to see the characters come alive as they sing and dance in the South created with the magical scenery designed by JOE RAGEY. This musical has soul, it is a wonderful production.